SEASONAL / LIMITED EDITION. A delicious coffee enhanced by the creamy pumpkin spice flavors of autumn. Fragranced with cinnamon and pumpkin pie spices, Pumpkin Spice coffee is a local favorite, especially lightened with cream and served with (or for) dessert. 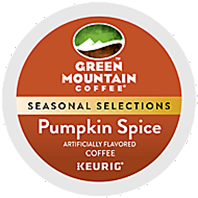 It's the perfect fall K-Cup pack!